I just got back from a weekend vacation. We stayed with my wife’s family in a cabin along the Mississippi River, located in the Northeast part of Iowa (for my niece’s graduation). No wireless in the cabin, but I didn’t miss it. It was good to be disconnected for a couple days. I visited with family, thought, and read. The only time I really used my smart phone was to check the weather. However, always a learner, I did take time to briefly reflect on my school’s progress in being more socially proactive with our students. We are in the midst of implementing the Positive Behavior Intervention and Support (PBIS) framework. It is an initiative that helps an entire building develop consistent expectations, as well as focus on the positive actions of our students whenever possible. Despite the sometimes bumpy ride when you implement any kind of initiative, I have been pleased with the progress we have made. One area of focus is the words we use with students when things are going well or need correction. The more all staff use the same language when addressing issues in school, the more students will consistently meet our behavioral expectations. Once home, with my mind freed up from the constant stream of information (i.e. 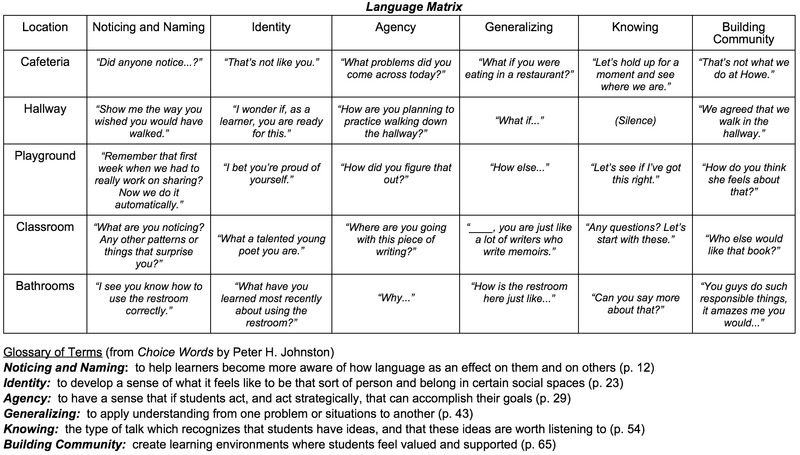 social media), I was able to transfer the work by Peter Johnston, in his book Choice Words, into a language matrix. As you can see below, example phrases are provided that would be applicable to several situations in each setting. This is on a Google Doc, for good reason. I am sure there will be suggestions for improvement, once the PBIS Team reviews this and the staff start to use these phrases. Many already do. However, it is nice to have a summary written down of what’s important from an essential resource like Choice Words, and applied to a specific setting. If you have additional suggestions for one of the responses, please share in the comments. would you share this with me via google docs? We did a book study of Choice Words last fall and are in the midst of planning for PBIS implementation in 13-14. I suggest going under “File” and select “Make a Copy” to have your own copy to revise and use. Thank you for this file. I was just trying to make my own and found yours. You’re welcome Christy. Be sure to give credit to the author, Peter Johnston, for the content. Excellent. We need more articles on positive reinforcement for students. Teacher’s comments do make a tremendous difference. And, yes, different situations need different responses. I am so pleased to see this article. I’ll have to get Peter Johnston’s book, Choice Words, and read it. You are on the right track with this in your school community, so keep it going. Thanks Janice. Choice Words is one of those few books that can change the way you teach, not just make your instruction better. I also recommend his follow-up, Opening Minds. This is an excellent article for educations. It gives very specific suggestions for how to respond to students in various situations. Administrators, teachers, and other educational personnel should read it. May I have permission to post the image of your matrix in a post on my blog? With link and attribution, of course. That is fine Edna, thanks for asking.